Drew Jones – Friend, IT Specialist, Philosopher? 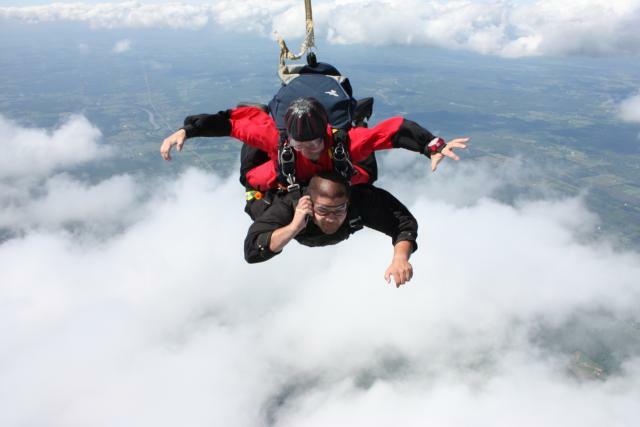 These pictures were sent to me by my friend Drew Jones, after he was done skydiving last week (he is the one wearing black). Drew always has a way of joking around and providing social commentary at the same time. The joke is obvious, he is using his Blackberry while he falls to the earth. I’ve gotta say – you don’t see that everyday. Supposedly, he responds to his technical work matters even in the most extreme conditions. If you read into this, he is saying much more than that though – with no words at all. Our society has become more than ‘connected’, we have become tethered to our little electronic windows into cyberspace. Here’s what that has to do with solder: Our electronics are becoming extensions of our bodies. Although this might seem silly, I bet there are some people out there who would rather give up an organ than forfeit their smartphone. So should the assembly of these devices be held to the same solder reliability standards as the medical industry? It is ultimately the customers who will dictate that, through the evolution of electronics – the theory of ‘natural [gizmo] selection’. Solder quality is important, solder defects must be reduced, and customers need to be impressed with the durability, functionality, and reliability of a product to truly set a brand apart in today’s electronics marketplace.